Period Farm Workers Cottage / Weavers Barn bordering onto open fields. Email using the Enquiry link. Weavers Cottage was originally converted from a 17th century weaving barn. It has tiled floors, exposed beams and can sleep 6. Ours is the end cottage in a row of four which are separately available. Step back in time to a simpler way of life with an open fire and beautiful rural countryside. A perfect chance to read a book, teach the kids to play cards and talk. The garden is great for children and birdwatchers alike, away from roads and bordering on to open fields. Ideal base for traditional bucket and spade family holiday but also a comfortable fit for a couple or small group of friends. We are well placed for North Norfolk's walking paths & birdwatching or just relaxing in the quiet countryside. Norwich and Kings Lynn are both under an hour away. Suitable for 2-4 adults and / or 2-3 children. Weavers cottage is the end cottage in a row of four which were converted from a weaving barn to farm workers houses in 1890. (Front door opens into) Boot Room with plenty of room for beach gear, wellies etc. There is a washing machine & drier. Kitchen with electric cooker, microwave, fridge and large walk in larder. The original openfire heated bread oven and copper are set in the chimney breast. Sitting Room/Dining Room has an open fire, comfortable seating, TV & wifi and a chest of drawers with board games. The table will seat 6 adults plus children. A french door opens out to the ‘breakfast garden’ and views across fields to Thursford Church. The gated entrance can accommodate parking for 2 or 3 cars. The large garden is enclosed and mainly lawn. The whole garden borders onto open fields. There is a picnic table on a leveled area for outdoor eating and the separate front garden has garden furniture to enjoy the morning sunrise. The garden and surrounding area are ideal for children, cycling and dog walking. Bed linen, duvets & towels are provided. Electricity with storage heaters. Wifi. Cleaning. Well behaved pets welcome. No smoking in the cottage. My entire life has been spent visiting north Norfolk and staying in Weavers Cottage. Every school holiday in the 60s & 70s, fruit picking as a teenager, trips with friends, visiting with my own family and now moving between London and Thursford. My parents bought the house in 1960 and purchased the contents, at auction in the garden, moving everything back inside where it belonged. We've moved ahead with the times; it's definitely warmer and more comfortable (!) but it's also a place of history that's hardly changed. The garden wraps around the house and at times, there's simply no need to go elsewhere. It's all here. Weavers Cottage is a welcoming, much loved holiday home near the coast. It's a real chance to have time out from the busy world we've become used to and offers some serious peace and quiet. Children love the space and the freedom in the garden and surrounding countryside. Yet its no distance at all from neighbouring Walsingham and the stunning north Norfolk coast. A rare find indeed. The bathroom is simple and functional with a dimples heater. Night storage heaters in living room, kitchen & landing. Wall heaters in master & bunk bedrooms. Dimplex heater in bathroom. Plenty of bedding and blankets. Coal fireplace. Right cupboard has wood and coal. Off street parking at the bottom of the garden. Additional cars can be parked off road on the green. 2 x sofas, easy chair, coffee table, dining table and chairs, chest of drawers containing local information and useful household items. Fridge and small freezer compartment. Electric hob, grill and oven. Plenty of pans, utensils, crockery and glassware. We like cooking. Period features including the original bread over and copper on either side of the fireplace. A large walk-in traditional larder, as cool as a fridge in the summer. Leaf table with additional chairs in the house if you have guests. TV with Freeview is available. A simple dvd, cassette and radio is available for use. You are welcome to browse through our books but do please leave at the house when you go. A few childhood toys are here to be used. A beautiful large grass garden is available for private use. It's full of mature trees; at nights you can hear the owls and watch the bats. There is a small walled back garden with patio set. Lovely property and was perfect for our stay. 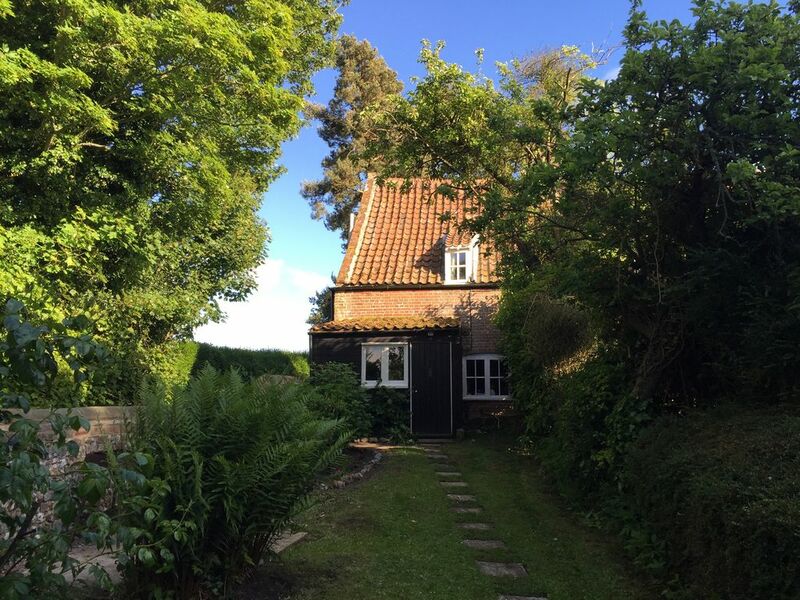 Lovely house, everything you needed and perfect for exploring Norfolk! What a fantastic property, full of character and charm. Very well equipped, warm and comfortable. The garden is huge and great for our dogs to run about too. We all loved the place, infact my 5 year old granddaughter said she wanted to live there! We hope to visit again in the near future. So glad you enjoyed your stay. I loved it there when I was 5, and now many years on. It’s a great place whether you’re a couple, a small group of friends or a family. And a haven for dogs. Wonderfully characteristic cottage in beautifully quiet location. It was just perfect for our kind of holiday! Great to hear you enjoyed our family holiday cottage. It is a special location and such a good base for the north Norfolk coast. Do come and stay again. The cottage was set in a beautiful quiet location, but close enough to coast and beach when required. It was exactly as described with all the amenities and utensils that one might require. Great to hear you enjoyed your stay in our family holiday cottage. The garden is great for children, adults and dogs where many an evening is spent star gazing and watching the owls & bats fly overhead. It feels a long way away from normal, busy life! On arrival, we felt welcomed - the heating on and tea and biscuits provided. It was spotlessly clean, beds made up and towels laid out. Generally it seemed well cared for. The living/dining room has two comfortable sofas. We did not need the coal fire as it was plenty warm enough without (late October). The beds were also very comfortable with ample extra blankets etc. The kitchen is quite small and basic - cooking a meal for 6 required a bit of juggling. There's plenty of pots, pans and crockery. Again, the bathroom is small and basic. Be aware that the stairs are very steep. If you want Ikea- type furnishings and modernity this is not for you. We really liked everything just as it was. In the area we liked the beach at Wells-next-the-sea with it's huge sweep of sand, the narrow country lanes, the Walsingham to Wells miniature railway and walking in the woods. Relax in the garden, have a bar-b-que, go for a cycle ride or explore on foot. The Thursford Collection is within walking distance (traction engine and steam organ museum). The quiet country road is about 200m from the Cottage so the area is ideal for letting the children roam free. *Wells.Next.The.Sea (6 miles)- Golden sand, beach shop, multi coloured beach huts and good fish and chips. *Blakney (7 miles)- Salt marshes, mud flats, and safe water. Crabbing heaven off the quay. Hours of fun. (Crab lines provided.) Good pubs. *Morston (7 miles)- Boat trips out to bird sanctuary and to see the seals. Good place to hire sailing dinghies. *Cley (9 miles)- Look around a real windmill and go for wonderful walks along the salt marshes. *Cromer (16 miles)- Traditional sea side town. -Only weekly bookings, or longer, are available which start on Saturday. Departures by 11am and arrivals after 3pm.. -Linen is provided and the cottage is cleaned before and after your visit.